Western blot analysis of extracts from human testis and kidney tissue using ACE2 Antibody. 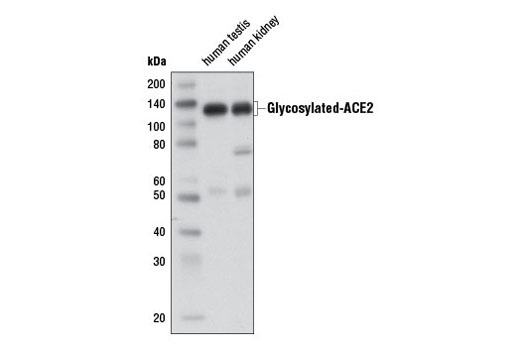 ACE2 Antibody recognizes endogenous level of glycosylated ACE2 protein. This antibody also cross-reacts with 55 and 75 kDa proteins of unknown origin in some cells. Polyclonal antibodies are produced by immunizing animals with a synthetic peptide corresponding to residues near the amino terminus of human ACE2 protein. Antibodies are purified by protein A and peptide affinity chromatography. ACE2 is a carboxypeptidase that catalyses the conversion of angiotensin I to angiotensin 1-9, or of angiotensin II to the vasodilator angiotensin 1-7 (1). ACE2 is a critical component in the renin-angiotensin system (RAS). ACE2 is predominantly expressed in vascular endothelial cells of the heart and kidney and Leydig and Sertoli cells of the testis (2,3). The unique expression pattern of ACE2 determines its essential role in the regulation of cardiovascular and kidney functions, as well as fertility. ACE2 protein is localized mainly in the extracellular space with its carboxy terminal end attached to the membrane via its transmembrane domain. Active ACE2 enzyme is secreted by cleavage at the amino terminus. Research studies have shown that ACE2 expression is elevated in human failing heart (4). ACE2 is also a functional receptor for SARS coronavirus (SARS-CoV) (5). Schmidt, B.L. et al. (2000) J Clin Microbiol 38, 1279-82. Boehm, M. and Nabel, E.G. (2002) N Engl J Med 347, 1795-7. Douglas, G.C. et al. (2004) Endocrinology 145, 4703-11. Goulter, A.B. et al. (2004) BMC Med 2, 19. Li, W. et al. (2005) EMBO J 24, 1634-43.